This guide provides detailed instructions on the correct use of BIG-FOOT Polymer Slurry and supplemental additives. Explained in this document is the standard way to handle and mix BIG-FOOT polymer drilling fluids. 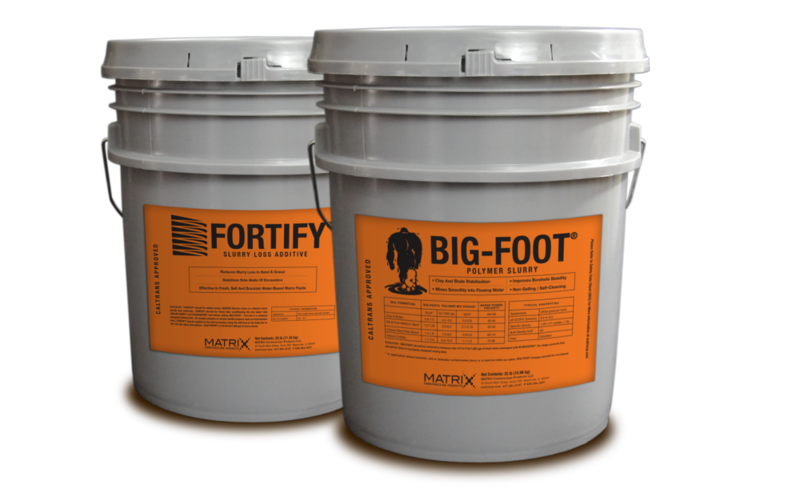 BIG-FOOT is a water-soluble polymer packaged as a granular material that works with a complete system process. Designed as a primary fluid, BIG-FOOT offers ease of use and reliable field success when used in the construction of drilled shafts and bored piles. Construction drilling using slurry and cold weather don’t mix that well. In the drilling industry when using slurry a number of things can go wrong when the temperature drops below 32°F. The polymer slurry will freeze. Taking a few simple precautions easily prevents damage and equipment failure due to expanding from freezing. Click for more information. BIG-FOOT polymer slurry works at specific optimal concentrations, similar to bentonite slurry. Without the proper polymer potency in the slurry, the slurry will not perform correctly by forming a membrane to help control slurry loss and check the slurry from entering the sidewalls of the surrounding formation. The recommended dosage of BIG-FOOT polymer and FORTIFY within the slurry is also needed to apply the required positive differential pressure against the sidewalls of the excavation. Click here for more information.